The Lost World Of Creedmoor Hospital – New York Times. Fear And Brutality In A Creedmoor Ward – New York Times. Inside Creedmoor State Hospital’s Building 25 – AbandonedNYC. Creedmoor Psychiatric Center – Wikipedia. “REPORT OF THE BOARD OF MANAGERS, October 30, 1912. Gentlemen. – We respectfully present the annual report of the Board of Managers of the Long Island State Hospital for the year ending September 30, 1912. The operations of the hospital during the year have been described in sufficient detail in the report of the Superintendent, which we adopt and present as part of our own…..The beginnings of the development of the Creedmoor property have been made with some success and a promise of much larger achievement. The report of the Superintendent gives details. Plans for an institution with a capacity of over 2,000 have been presented to the Board by the State Architect, discussed at length and finally adopted. It is earnestly hoped that definite action to carry them out may be made possible by legislative appropriation. The necessity for such provision is apparent to all who have given even slight study to the problem of the metropolitan insane. We are gratified that the need of thorough rehabilitation of the present hospital has been recognized by the Commission to the extent that the report of the Superintendent shows; and that in addition, appropriations are being considered for further alterations in the buildings and the erection of several new ones. Respectfully submitted, A. E. ORR, President, Board of Managers of the Long Island State Hospital. CREEDMOOR – The land and premises situated at Creedmoor in the town of Queens, thirteen miles distant from the main hospital, acquired by legislative act of 1908, have continued subject to the control of the Commission and the board of managers of the Long Island State Hospital. This property originally comprised 192 (200) acres, but at a time when it was decided to sell this land and acquire a new site, nearly seven acres for roadway purposes were sold to the Long Island Motor Parkway, Incorporated, for $18,942. This money was reappropriated by the Legislature for the alteration of the existing buildings and for new construction generally. The roadway passes through the grounds diagonally in a northeasterly direction, and for the most part through the wooded, upland portion of the premises. It is below grade and properly protected by a fence and an overhead crossing. The parkway would not seriously interfere with the erection of new buildings for hospital purposes in the level area southeast therefrom, and some preliminary steps have been taken and are still under way to plan for such buildings, since the difficulty of acquiring a new site on Long Island is fully recognized by the Commission and the Managers. In April, 1912, the Governor signed, among other items in the Omnibus Bill, an appropriation of $50,000 for the commencement of the erection of buildings, including a railroad switch, power house and farm cottages. 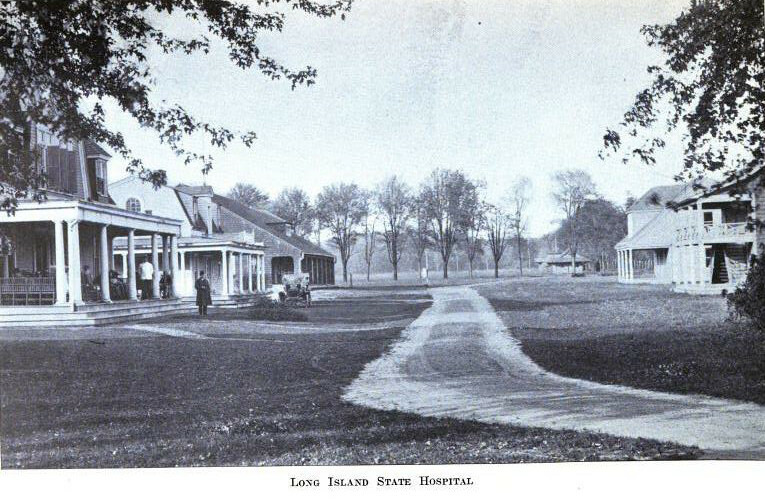 SOURCE: Annual Report of the Long Island State Hospital to the State Hospital Commission For the Year Ending September 30, 1912, Albany, J.B. Lyon Company, Printers, 1913, Pages 6, 16, 17. SOURCE: The Encyclopedia of New York City: Second Edition, Kenneth T. Jackson, Lisa Keller, Nancy Flood, Yale University Press, 2010. The institution is very greatly overcrowded, but it is hoped to obtain relief at an early date. There is under construction, and to be soon completed, a reception hospital and a building for the care of the chronic type of patients. The reception hospital will accommodate about 150 patients, while the building for the chronic type will accommodate 450. Foundations for a new store house and cold storage building have been laid. A large number of repairs have been accomplished during the last year. The domes of the main building have been renewed and painted. A large quantity of flooring has been laid and a number of the wards have been repainted. A number of cottages at Creedmoor are being remodelled and made ready for occupancy, and it is expected shortly to house at least 150 patients at this branch. This hospital has been visited during the year by the State Finance Committee, the State Hospital Development Commission and the State Hospital Commission, and it is the concensus of opinion that the present old building should be razed and new ones built. There is planned a new and modern psychopathic hospital that will accommodate the needs of this portion of Greater New York. When plans have been consummated, this site will accommodate about 2,100 patients, while at Creedmoor plans are in contemplation for about 2,500 patients. The medical service is very active at this institution. At least 51 per cent of the cases admitted are of the feeble and exhausted type, or of the very acute maniacal type, and are brought in on stretchers. Those who are physically able are sent to Kings Park. The admissions here during the year were 626. Beginning July 1st, we organized a school for male patients and a male instructor was appointed. It is hoped to obtain very beneficial results from the re-education of certain cases. In August, 1916, a social worker was appointed who has been of great benefit to the institution and to the paroled patients. She visits all patients who are paroled, attends the clinics, inspects environmental conditions, obtains positions for recovered patients, and assists in obtaining proper histories for the physicians. Three outdoor clinics are held weekly, one at the Brooklyn State Hospital, one at the Williamsburg Hospital on Saturdays; and one at the Long Island College Hospital on Fridays. These clinics are of great value, as it is through them that information is spread that is of great use to the general public. The present census is 925; the certified capacity is 637, and 70 patients are on parole. At the east of the institution there is an old potters’ field which has been used for years for the burial of the poor of Kings County. This land was turned over to the state two years ago, and it is now proposed to construct buildings on this area. Therefore the Charities Department of the City of New York was requested to remove the bodies buried there by that department during the last two years, and several hundred bodies were taken away during the summer. SOURCE: The American Journal of Insanity, Volume 74, 1917, Pages 353-354. An investigation of the sanitary conditions of the Brooklyn State Hospital at Brooklyn was made by Mr. C. A. Howland, assistant engineer in this Department on August 15, 1919. Previous examinations of the sanitary condition of this institution were made by this Department in 1915, (see page 906 of the 36th Annual Eeport) and in 1917 (see page 642 of the 38th Annual Report). Location: The main institution is situated in the borough of Brooklyn, New York City, while Creedmoor Farm is located north of the village of Creedmoor close to the eastern boundary of Queens borough. Site of institution: The hospital is situated in Brooklyn on Clarkson avenue just east of the Kings County Hospital. Although the grounds of the institution in Brooklyn are somewhat flat they are apparently well drained. At Creedmoor the farm land, much of which is under cultivation, is also flat but appears to be well drained. Area of grounds: 25 acres in Brooklyn; 195 acres at Creedmoor; total, 220 acres. Number of occupied buildings: 14 (2 practically complete but not occupied, one in course of construction). Capacity: 343 men, 457 women, 305 employees; total, 1,105. Present population: 441 men, 603 women, 206 employees; total, 1,252. Class of inmates: All classes of insane except the criminal insane. Water supply: The water supply for the main institution in Brooklyn is obtained from the Flatbush Water Company while the water supply for the Creedmoor farm is obtained from the Jamaica Water Supply Company. Milk supply: The milk for the main institution in Brooklyn, which amounts to about 400 quarts of fluid milk, grade B, pasteurized, and 40 quarts condensed milk, are purchased per day from the Delancy Milk and Cream Company of Brooklyn. At Creedmoor farm the milk supply is obtained from a herd of five cows. The cow barn in which the milking is done is an old wooden structure which was not in a satisfactory sanitary condition at the time of the inspection. Sewerage and sewage disposal: The sewage and storm water of the institution in Brooklyn is discharged through combined tile and brick sewers ranging in size from 6 to 18 inches into the sewerage system of the city of Brooklyn. At Creedmoor the sewage is at present discharged into two large cesspools located about 300 feet northwest of the building. A sewage disposal plant which will treat the sewage from the hospital to be ultimately constructed at Creedmoor is in the course of construction. This disposal plant will consist of Imhoff tanks, siphon chamber and sand filters, of which the inlet chamber, Imhoff tank and siphon chamber have been completed. Refuse disposal: The garbage of the institution is fed to pigs at the Creedmoor farm. The garbage not suitable for feeding is disposed of in the institution incinerator. At the time of the inspection it was found that the piggery was not in a satisfactory condition and the engineer was informed that a new piggery is to be constructed. It was found that the barrels in which the garbage is stored at the institution were in some cases without covers. Rubbish, such as broken crockery, etc., is removed by the city street cleaning department. Waste paper is baled and sold and similar disposal is made of the rags. Combustible refuse is collected twice daily and burned in an incinerator of the Morse-Boulger Destructor type. As a result of this examination the following recommendations were made in regard to the improvement of certain insanitary conditions found at the institution. 1. That the garbage receptacles be kept covered at all times. 2. That a modern piggery of proper design and construction be built as soon as possible. 3. That every precaution be taken in the handling of the milk at the Creedmoor farm in order to prevent the communication of disease by this means and that a plant for the pasteurization of the milk be installed as soon as practicable. 4. That the sewage disposal plant for Creedmoor be completed according to the plans approved by this Department and be put in operation as soon as possible. SOURCE: State of New York, Fortieth Annual Report of the State Department of Health for the Year Ending December 31, 1919, Volume II, Report of Division of Sanitary Engineering, Albany: J.B.Lyon Company, Printers, 1920, Pages 421-422. I’m not sure if Creedmoor State Hospital had a cemetery, they may have used a public cemetery. This entry was posted in Anonymous Graves, New York State Hospitals, Custodial Institutions & Cemeteries, The Inmates Of Willard Blog, Willard Blog and tagged Brooklyn Psychiatric Center, Creedmoor, Creedmoor Psychiatric Center, Creedmoor State Hospital, Long Island State Hospital, Mental Illness by lsstuhler. Bookmark the permalink. Thank you for your information and web site. My paternal Grandfather was in Creedmoor from 1926 until he died October 1950. I have tried everything I could to get information why he put himself in the hospital and was there so long. He must have been strong. Creedmoor also will not tell me where he is buried and getting a death certificate from NYCity is a labyrinth of non-information. My parents both died when I was in my early 20’s and never would speak of any thing of the past so I have pieced together what I have been able to. Coming to a site like this gives me hope. I live in Arizona so I can’t just actually go there and try to find the answers. Thank you for all you have done. There has to be many like myself in search of information to give us a family history. God Bless you for getting together this information. Thank you, Judith. You can get a copy of the death certificate from the NYS Vital Records genealogy page. It will cost you but it may also answer a few questions for you as well. Sometimes it tells where the person was buried. Thanks so much for the information posted! My grandmother passed away while being a patient at Creedmor in 1920. She raised a wonderful family and wondered why she ended up there? That has always been a mystery to me for many years, and only found out in a genealogical search. I was told she passed away giving birth to my father, but obviously that wasn’t the case. How or can I obtain the circumstances surrounding her admittance and her passing. Thank you again for shedding some light on this. That’s a tough one, Bill! NYSOMH will not allow access to patient medical records even if you are a descendant. I used the family medical history of my mother’s family to come up with a theory as to why my great-grandmother was admitted to Willard about 1924 and died there in 1928. Dementia runs on my mother’s side. There were no nursing homes as we know them until the 1950s. After her husband died, I believe she was put there because my grandparents couldn’t take care of her having a young family of 5 children, 7 by 1928. She was about age 72 when she was admitted. I can’t get positive proof but this is one way to take a stab in the dark. Best of Luck and Thank You so much for writing!! Hi Bill, my grandfather was admitted in 1926 in his early 50’s and died their in 1950. We have no idea why either, my parents are both gone, and they didn’t mention it. I contacted Creedmoor, one of the chiefs of neurology at one of the top hospitals in the country wrote and inquired because he needed history for my well being. He was told they didn’t have it which was bogus as I had gotten the info of his date of admittance and it said self admitted, but they won’t say why and they have the admittance form. NY has some ridiculous ideas on the books to forever protect the dead, I think it’s more to protect what went on there. I asked if he was buried there and they referred me to getting his death certificate from the state and said it would show. So far I have sent away all the info needed with a check each time, and gotten no info or death certificate but they sure keep the money. Until I can physically go to Creedmoor and ask to see the documents they won’t copy, there is nothing I can do. I would suggest you take a trip there and be very persistent and also get a copy of her death certificate which will say reason of death ( hopefully ) and where she is buried. Good luck getting through the maze of protection these places have had for years! My mother was a patient of the hospital during the 1950s. Could I obtain the hospital records during this period? Hello, So far I have tried 4 different departments in NYC that are listed on this site, I have enclosed the amount of money required each time, a copy of my birth certificate, my father’s birth certificate and information on my grandfather who went to Creedmoor in 1926 and died there in 1951 and so far they say I am not contacting the right agency, don’t tell me what agency I need and they keep all the copies of the documents and keep the money. I hope you have better luck. If you do could you please contact me as to which agency you finally got to give you the information? I have been trying to get this information for years. I never knew my grandpa was in this place, my folks never spoke of it, and they are gone many years. I started poking around on Ancestry and found out. I have written to Creedmoor and gotten the date he self-admitted and the date of his death, and surely they know why he admitted himself but they won’t tell me. I was told that if I actually went there and bugged the daylights out of them they would show me the pages in their logs so I could read them but they won’t violate the ridiculous archaic New York laws and just tell me. I even had the chief of Neurology from one of the most prestigious hospitals in the country write and request the information and he was not responded to. I have medical needs to know this information and an emotional need to know where he is buried, and what all happened, as you do and understand. So please, if you have better luck than I have had, please contact me..
Wow, reading the comments above…I’m in for a difficult process. My grandfather Lloyd W. Record died in Creedmor on April, 29th 1950. The undertaker was Moore Funeral home. I applied for Lloyd’s death certificate online. I got an email back stating that information is being mailed to my address. I don’t feel hopeful on what the information will/will not be reading this blog. If you sent your money to the NYS Vital Records, you will get many questions answered from the death certificate, but forget about getting your grandfather’s medical records from Creedmoor. Could I please have the address you used to get your Grandfathers death certificate? I have been given many addresses, sent all the documentation and the $40 each time, and only have gotten a letter back ( never the money or documentation) saying it was the wrong office. My Grandfather was in Creedmoor from 1926 until his death in 1951, I had no idea, my parents are both deceased when I found out, and I would dearly love to find out what more I can. My doctor who is Chief of Neurology at a world renowned hospital wrote to Creedmoor to try to get his medical records, and information and they lied and said they didn’t have them, but gave me the date he was self-admitted and the day he died, but nothing else. If they have that info they have the rest. Thank you so sincerely. New York State will not give historical medical records, even if your ancestor has been dead 100 years, because of the HIPAA Law. You can, however, get a copy of the death certificate from the state. Thank you. NY is an extreme about the laws. Where I live you can get them easily as long as you prove relation. I was told NY won’t release info from the asylums because of the abuse that went on in them! Same with the one big one in Michigan. Hello, my grandfather was a psychiatrist at Creedmoor from the late 1930s to 1960, and my father grew up there. He was born in 1939 and didn’t leave Creedmoor until he was 17 years old. I am embarking on some research and am seeking other people who were children of staff members and grew up at Creedmoor. But I’m also searching for people who have some information or stories about their relatives who were staff or patients there, especially in the 1940s and ’50s. Thanks.